Plasma scientists are now comparing electrical discharge formations in the laboratory to rock art images around the world. Results in 2005 should confirm that immense and terrifying plasma configurations were seen in the sky of our ancestors. In his investigation of rock art themes, Peratt concentrated his field work in the American Southwest and Northwest, but he also gathered data internationally. For his on-site study he used GPS longitude and latitude positions, always noting the orientation and field of view. A team of about 30 volunteers, including specialists from several fields, assisted Peratt in the investigation, and he has since gathered more than 25,000 rock art images. The illustrations of one interesting formation—the “squatter man” shown above--are taken from Peratt's recent paper in "Transactions on Plasma Science" of the Institute of Electrical and Electronics Engineers, in December 2003. 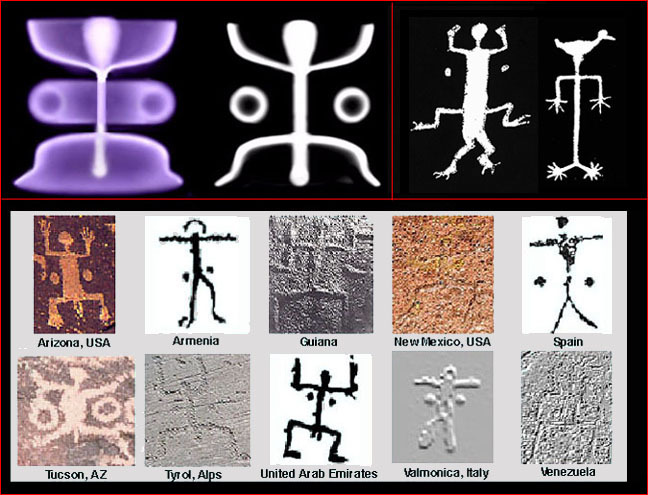 Peratt states his conclusion forthrightly: The recurring petroglyph patterns "are reproductions of plasma phenomena in space". Peratt’s findings are particularly significant in their contrast to traditional explanations of rock art. The majority of rock art authorities, particularly those with primary interest in Native American sources, argue that only images of the sun, moon, and stars reflect actual celestial phenomena. Apart from such associations, most authorities claim that global patterns do not exist. Rather, they tell us, the ancient artists projected onto stone the subjective content of shamanistic trances. Peratt’s investigations say the opposite, and they confirm dozens of patterns of rock art that occur globally. Through massive labors, some apparently taking whole lifetimes according to Peratt, the artists recorded immense discharge phenomena in the heavens. The “squatter man” configuration depicted above occurs when a disk or donut-like torus around a linear discharge column is bent by magnetic fields induced by intense current flow. From the viewpoint of the observer, the edges of the upper disk may appear to point up (forming "arms") and those of the lower torus may appear to point down (forming "legs"). The underlying “hourglass” pattern, with many subtle variations, occurs around the world. Our idealization shows slight variations between the upward-pointing and downward-pointing components, consistent with common variations in the laboratory and in rock art. The upper “champagne glass” form results from a distortion of a disk as the edges curve upward. In the warping of the disk below, the downward curvature is interrupted at the extremity, which bends outward to create a “squashed bell” appearance. The rock art images shown above include other variations as well. Sometimes, the “arms” and “legs” of the “squatter man” are horizontal, while at other times they are more squared than in our graphic representation, but both variations are characteristic of intense plasma discharge. Our idealization of the hourglass discharge form accents the visual relationship of the two symmetrical dots or circles to a transparent doughnut-like torus, viewed edge on. But many other nuances of such discharge configurations must be taken into account. The warping of the upward and downward extremities of the hourglass form can occur in almost limitless variations. To illustrate the extent of the variations anciently recorded, we offer two interesting examples in the upper right frame of the montage above. The first, closely tied to the more elementary “squatter man” formation, includes the two dots to the right and left of the torso. The incongruous additional pair of “legs” also accord with observed patterns in the evolution of Peratt instabilities, which typically send out stacks of “arms” or “legs” in the very fashion depicted. Even more bizarre is the accompanying squatter man whose head is replaced by the body of a duck. But this pattern too, particularly widespread in the Americas, is no accident according to Peratt. If Peratt’s conclusions are correct, then only a few thousand years ago the terrestrial sky was ablaze with electrical activity. The ramifications of this possibility will directly affect our understanding of cultural roots. What was the impact of the recorded events on the first civilizations? What was the relationship to the origins of world mythology, to the birth of the early religions, or to monumental construction in ancient times?